We continue the series of reports of students who have become winners of the “Digital and Information Technologies in the Electronic Media Industry-2018” conference and competition. This year students from several Russian universities fought for the main prize - a trip to Amsterdam to the International Broadcasting Convention IBC2018. Ivan Lyapin from St. Petersburg State Electrotechnical University "LETI" shared his impressions of the trip. This year I and four other students were given the brilliant opportunity to attend IBC 2018 (International Broadcasting Convention). 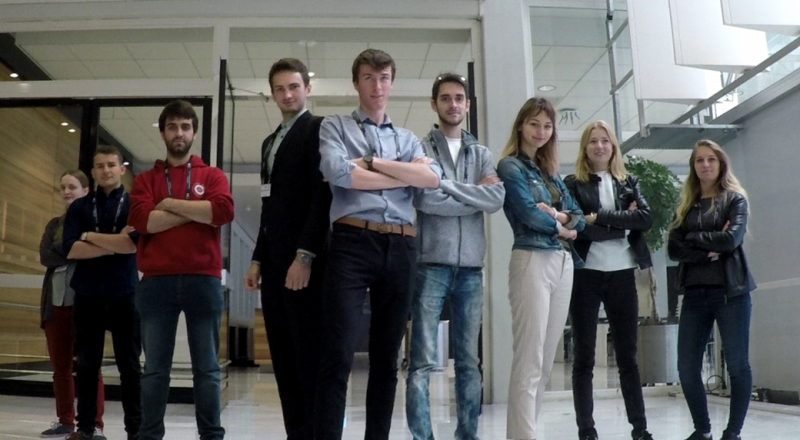 We were selected as winners of the student competition conducted by the Saint-Petersburg State University of Film and Television, and sponsored by IEEE BTS and IABM to visit "The World's Most Influential Media, Entertainment & Technology Show" in Amsterdam. Needless to say, every one of us was extremely excited to see with our own eyes what the modern broadcasting industry has to show, and to hear what the people who help shape it have to say about its future. I was particularly interested in recent advances in IP transport and delivery adoption, integration of the upcoming 5G networking technologies, and in state-of-the-art video and audio coding solutions for broadcasting applications. And, of course, IBC had me covered. One of the first conference sessions in the “Tech Talks” section was the discussion on 5G. Speakers from Spectrum, ARRIS, Qualcomm and BBC presented their research on how to properly integrate 5G into existing infrastructures to use it with most efficiency, what problems will have to be solved during this process, what milestones the industry still needs to pass before adoption, and discussed in detail the potential applications for 5G. Perhaps, the most interesting conference session for me was “Tech Talks: Codec wars”, because as of today, the field of video encoding is transforming from being dominated by a single video coding technique to multiple companies offering differing solutions. And so, this session featured an in-depth evaluation of performance of HEVC, AV1 and JEM, a presentation on potential applications of AV1, a demonstration of a new low-profile codec called xvc, and a heated discussion on how all these coding standards will manage to coexist on the market, featuring experts from BBC, ATEME, Zetacast and Divideon. Another great session that I must mention was the “VR &amp; AR” Tech Talk, where Fraunhofer IIS talked about their solution for audio coding in immersive applications – MPEG-H. The IBC exhibition spans fourteen exhibition halls, and amongst huge filming and broadcasting equipment stands you could find some truly interesting pieces of technology. 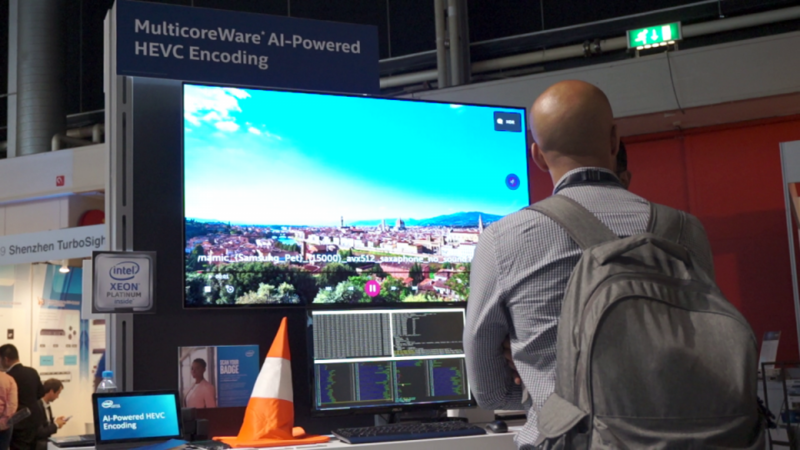 For example, Intel brought their AI-powered MulticoreWare HEVC encoder that brings together the power of machine learning and the open source x265 encoder to significantly improve video coding quality and shorten encoding time. A Future Zone stand of the University of Warwick demonstrated their AV1-based solution for broadcasting and displaying of HDR content. The Blackmagic Developers booth featured presentations on integrating an open-source computer vision library OpenCV with their hardware solutions. 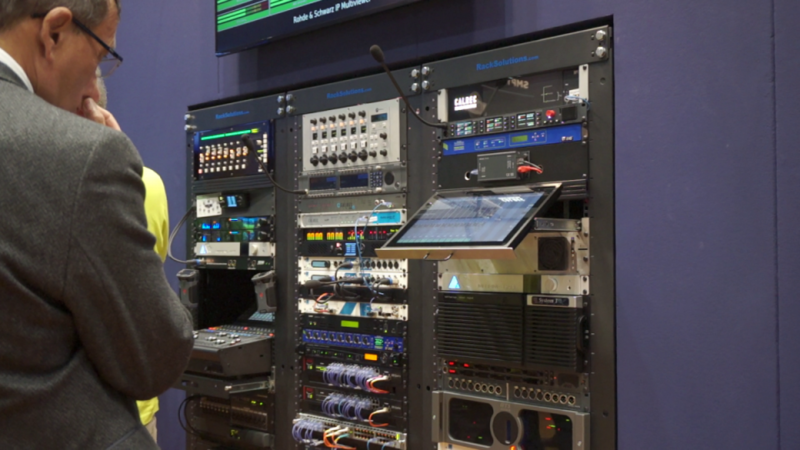 One of the highlights of the exhibition for me was the IP Showcase, where you could find many practical demonstrations of IP media broadcasting solutions, and attend presentations on how to build these systems to take advantage of workflow potential offered by IP-based standards. Between attending conference sessions and exploring the exhibition, we have been filming interviews with representatives of companies and organizations that host IBC: Bill Hayes (President, IEEE BTS), Peter White (Chief Executive, IABM), Theresa Wise (CEO, RTS), Chris Swires (Treasurer, SCTE), Thomas Bause Mason (Director of Standards Development, SMPTE), and David Crawford (Future Zone Producer, IBC). These industry professionals shared their views on the current technological trends in broadcasting, told us about their career paths and what today’s students need to know be able to secure a place in the broadcasting industry. I very much enjoyed our conversations with all of these people, and loved how much attention they and their respective companies are putting into educating and training young professionals. 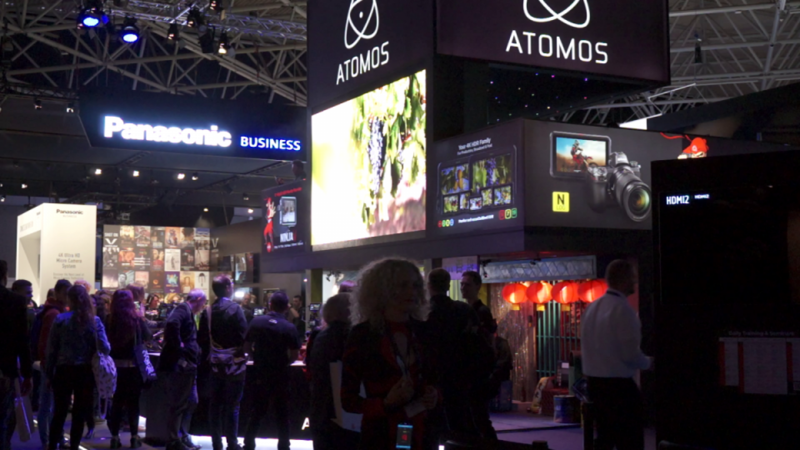 Attending IBC 2018 was a unique and profound experience for me, because being able to see the newest achievements in broadcasting technology, and to talk to leading industry experts is very refreshing and eye opening for a regular student like myself. This trip made me even more determined to work hard and become a young broadcasting industry professional, and to one day attend IBC not as a regular visitor, but as an exhibitor, or even a speaker. And for this opportunity I would like to thank IEEE BTS and Bill Hayes, Martin Salter of the IABM Educational Foundation, Konstantin Glasman and Evgeina Grinenko of the Saint-Petersburg State University of Film and Television. On September 13-18 the largest in Europe International Broadcasting Convention IBC2018 was held in Amsterdam (Netherlands). 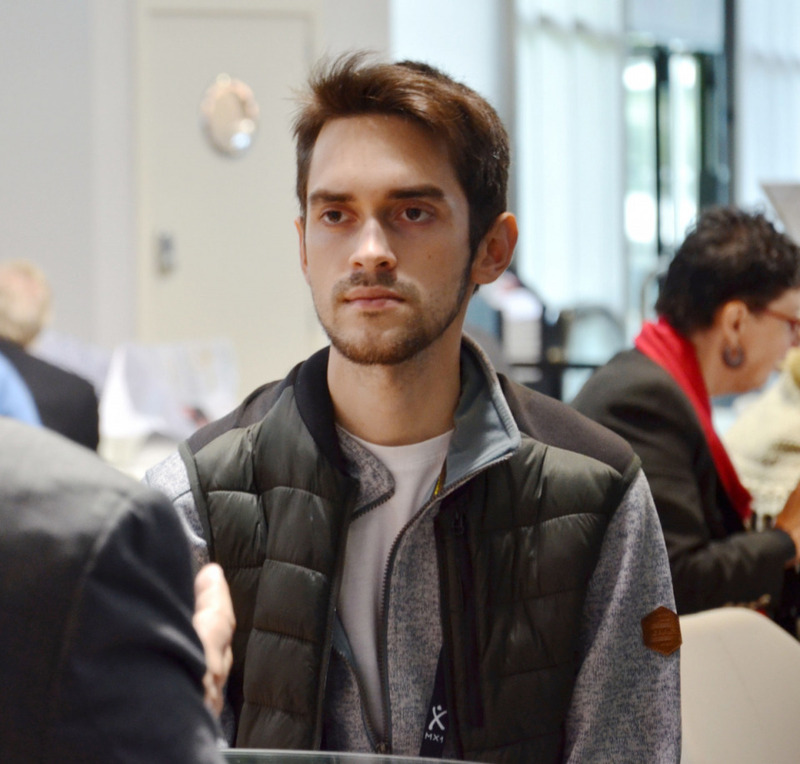 15 halls with 1,700 exhibitors from 170 countries of all around the world, 400 professional speakers - all this turned out to be a reality for student sfrom Russia, France, Germany and United Kingdom with the Bursaries from the IEEE BTS and the IABM Educational Foundation. First Bursaries from the IABM were introduced in 2002, when 2 students from Ravensbourne College in the U.K. were selected, and then were extended to four students for 2003 and 2004, when two pairs of students from Ravensbourne College, UK and St. Petersburg State University of Film and Television, Russia were selected. Then, IEEE BTS established its own bursary program. In 2018, 11 students from Russia, France, Germany and United Kingdom whose studies are related to broadcast engineering were granted and visited IBC2018 to enhance their knowledge and to improve their potential career value.